Want to time travel? Or make clones of yourself? Or transmogrify yourself into something else; let’s say, a pterodactyl or a dinosaur or a lion? You’d be wondering what is the connection between these apparantly discrete activities. What if I told you that you could do all of these with one simple device – a corrugated cardboard box? Well, at least in Calvin’s world, you can. You can change the function of the box by simply turnning it from one position to another and changing the label. Let’s say you want to time travel – all you need to do is keep the box’s face up with the top open and sit inside it. Well, you have to be careful with which way you are sitting; otherwise you may time travel the wrong way. Calvin once went into the past when he really intended to go into the future. He realized his mistake when he saw a dinosaur. The same cardboard box works as a duplicator when the box is standing on its side. The first thing Calvin tried to duplicate after ‘inventing’ the duplicator was himself. He thought that his duplicate could do all his chores for him, like cleaning his room, doing his homework, taking out the trash and the like. However his plan backfired as his clone behaved exactly like him. He refused to do any of Calvin’s work and in fact, in Calvin’s absence, his clone created more duplicates. This spelt trouble for Calvin as he got blamed for everything his duplicates did. Calvin tried to salvage the situation by making a deal with all his duplicates, which stipulated that they would take turns to go to school. However, this proved to be a very bad idea as the duplicates kept being sent to the Principal’s office every day, a feat that even Calvin could not manage on his own. Later he upgraded the duplicator by adding an ‘ethicator’ (really just an arrow that points to either ‘Good’ or ‘Bad’). Calvin used this to create a ‘good’ version of himself to perform various chores and go to school. The ‘good’ version has hair that is combed flat, is extremely helpful and responsible, is quite even-tempered, and, unfortunately for Calvin, has a huge crush on Susie. However, when the duplicate gets to know about Calvin’s reputation (through Susie), he becomes angry; and when he threatens to rip Calvin limb from limb, he is destroyed for having an evil thought (which Calvin describes as a “built-in moral compromise spectral release phantasmatron”). Now let’s move on to the next function that the cardboard box can perform – a transmogrifier which can turn one thing into another. All you need to do is turn the box upside down. One needs to get under the cardboard box to get transmogrified. A dial on side needs to be set to whatever the user wants to be transmogrified into. The transmogrifier’s dial is an arrow that is turned to a setting, which is whatever animal, plant, or thing you want. Originally, the dial had only the settings ‘Eel’, ‘Baboon’, ‘Bug’, and ‘Dinosaur’, but Calvin left room to write more names on the box. The transmogrifier came in handy for Calvin when he created the duplicate mess described in the preceding paragraph. 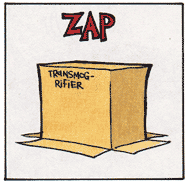 He simply changed the duplicatror into a transmogrifier by turning the cardboard box upside down. He lured his duplicates under the box and transmogrified them into worms. If only I could lay my hands on that transmogrifier. There are plenty of people I’d like to transmogrify into worms. Calvin and his cardboard boxes hold a very special place in my life. Calvin’s flights of fantasy in these boxes have eased a lot of stress and have inevitably succeeded in bringing a smile to my face. Thank you Mr. Watterson for creating Calvin and his cardboard boxes. I don’t know what I would have done without them.